Daikon is very low in calories. A 3 ounce serving contains only 18 calories and provides 34 percent of the RDA for vitamin C. Rich in vitamin C, daikon contains active enzymes that aid digestion, particularly of starchy foods. The name originated from the Japanese words dai (large) and kon (root), this vegetable is in fact a large radish with a sweet, tangy flavor. The daikon’s flesh is crisp, juicy and white. Daikon radish can be eaten raw; however, they do have a hotter flavor than red radishes. Daikon radishes can be added to salads or shredded or grated for slaws or relishes, and are also commonly used in stir-fries. They are great pickled and are often seen grated and served with sashimi. 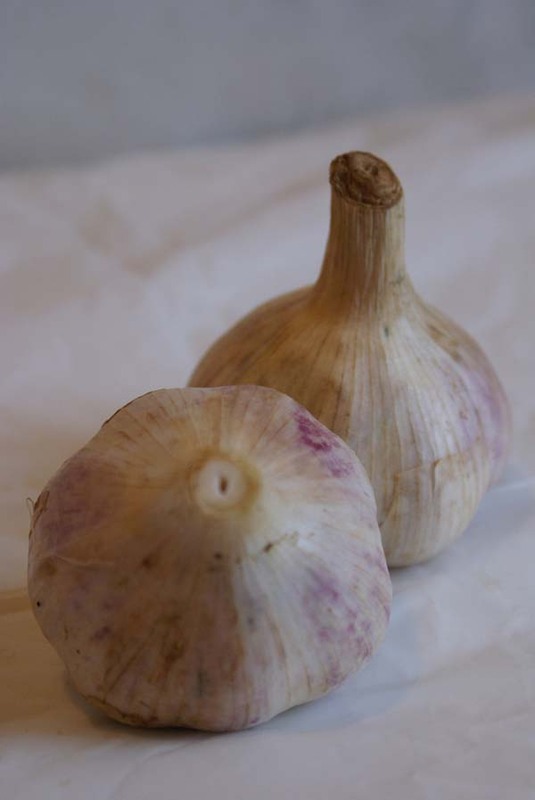 Store in a dark, cool, dry place with plenty of ventilation and your garlic will last from several weeks to one year. That said, try to use fresh garlic within a few weeks and do not refrigerate unless the garlic has been peeled or chopped. Part of the lily family, garlic is closely related to shallots, garlic-chives, and leeks. Garlic has been cultivated since ancient times. It was said that Egyptian masters fed garlic to the slaves to increase the worker’s physical power. Garlic is arranged in a head, called the “bulb,” averaging about 2 inches in height and diameter consisting of numerous small separate cloves. Both the cloves and the entire bulb are encased in paper-like sheathes that can be white, off-white or pinkish. Golden Earthworm Organic Farm grows the less common hard-neck variety. Garlic can be eaten raw or cooked. Pressed or pureed garlic releases the most oils and therefore provides the strongest flavor. Crushed garlic is good in sauces when you want a strong garlic flavor. Minced garlic releases more oils than chopped or sliced garlic, but less than pressed or crushed. Great for flavoring oil to be used for sautéing. Chopped garlic does not extract a large amount of juice or oil. The amount of flavor obtained will depend on how small the garlic is chopped and allowed to dissolve in the cooking process. This method is good for use in salsas and stir-frys. Sliced garlic won’t completely dissolve when cooked resulting in a lighter garlic flavor. Garlic browned in oil yields a strong nutty flavor. 1/8 teaspoon of garlic powder is equal to approximately 1 minced garlic clove. Garlic scapes are the top of the garlic plant; the young unfurled seedpods that form on hard neck garlic plants in June. This delicious stalk has a taste that is milder than mature garlic. 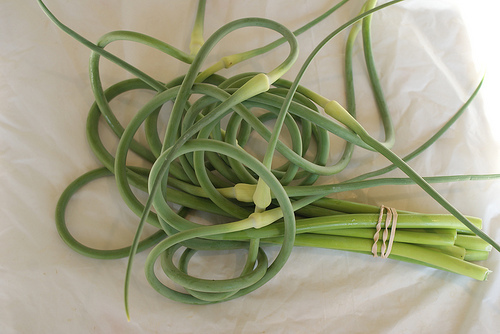 Garlic scapes are traditionally used in Southern, Eastern European, and Korean cuisine because of their subtle garlic flavor, tender-crisp texture, and nutritional potency. Remove the top head (the bulbous lighter part). You can cook with it as you would regular garlic. But you can also use raw in everything from soups to salads to garnishes and stir-fries b/c the flavor is less intense than a garlic clove. 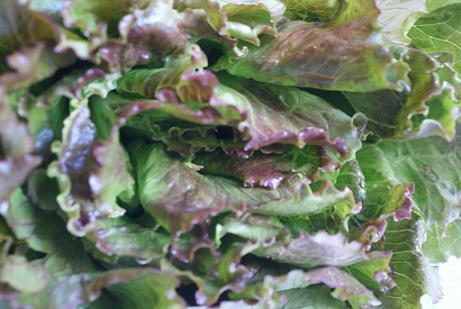 Batavia lettuce is a non-hearty lettuce with frilly leaves. Its crunchy nutty flavoured leaves grow upright to form a loose leaf head. Batavias are in the same family as iceberg and have an excellent shelf life, maintaining their crispness from the time they’re harvested until the time they reach the dinner table. It is of French origin but is very popular all over Northern Europe. Here it is often found in home gardens and farmers markets. Leaf lettuce should be washed and dried before storing in the refrigerator to remove their excess moisture. It should be stored either in a plastic bag or wrapped in a damp cloth and stored in the refrigerator crisper. Peppers come from the colorful Capsicum family which splits into two main categories – sweet bell peppers and the spicy chilies, such as jalapenos. Chilies have capsaicin, sweet peppers do not. You can’t differentiate the sweet bell pepper varieties when they’re still young because they all look green. As they ripen, they’ll change color. Depending on the stage of ripeness and their variety, their colors range from orange, yellow, red, purple, brown, black, ivory or green, and so do their sweetness. Sweet bell peppers are also known as capsicums, sweet peppers or green / red peppers. 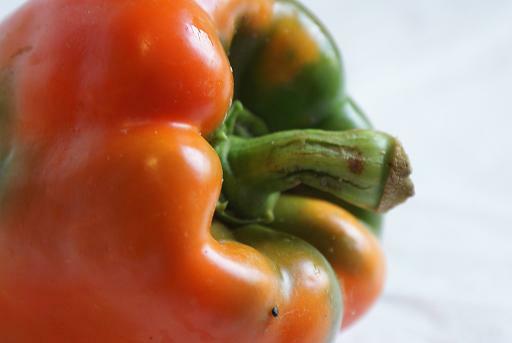 Store unwashed bell peppers in a plastic bag in the refrigerator. Sources say they will stay fresh for about a week but we have seen them keep a couple weeks. Green bell peppers will stay fresh a little longer than the yellow and red ones. One cup of chopped green pepper has 3 grams of fiber, 4 grams of sugar and one gram of protein. It contains 200 percent of your daily allowance of vitamin C! It is also a good source of potassium and maganese. Kohlrabi is also called German or cabbage turnip. It is a low, stout cultivar of the cabbage that will grow almost anywhere. It has been selected for its swollen, nearly spherical shape. The name comes from the German Kohl (“cabbage”) plus Rübe ~ Rabi (Swiss German variant) (“turnip”), because the swollen stem resembles the latter. 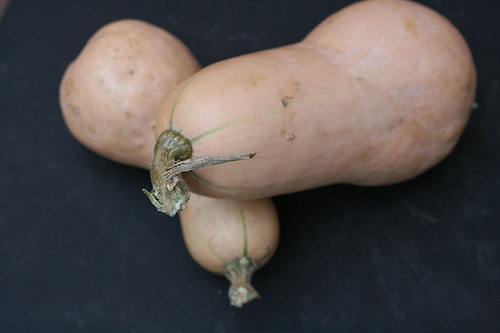 However, the actual “Kohlrübe” exists too and corresponds to the rutabaga in English, which is distinct from the kohlrabi. Kohlrabi has been created by artificial selection for lateral meristem growth; its origin in nature is the same as that of cabbage, broccoli, cauliflower, kale, collard greens, and brussels sprouts: They are all bred from, and are the same species as, the wild cabbage plant (Brassica oleracea). Boiled, steam, or eat raw. Be sure to peel the outer layer. Don’t forget you can eat the greens! turnips, white radish, broccoli stems. 1 cup of cooked Chinese broccoli has about 19 calories, 1 gram of fat, sugar and protein, and 2 grams of fiber. It has unusually high Vitamin A content at 29% of our daily recommended intake and 41% Vitamin C! It is considered a good source of vitamin E , folate, calcium, iron and zinc among other things. Chinese broccoli is also known as Kai lan or Chinese kale. It has a long stem, leaves, and broccoli like flowers that are smaller than standard broccoli. The flavor is similar to broccoli rabe and some suggest it is one and the same though we found conflicting information on that front. It is in season in Spring or late Summer. Wrapped in plastic, it will keep in the refrigerator vegetable crisper for up to a week. 1 cup of raw green beans has 34 calories, 2 grams of both protein and sugar, 4 grams of fiber and 30% of your daily intake of Vitamin C. Green beans are a low sodium food and considered a good source for Vitamin A, folate, and iron. Green Beans are available year round, but peak of the season is May thru October. They were first served by the French but were initially found in hot regions of the Americas, India, and China. They are considered nitrogen fixers, which means they have the ability to draw nitrogen from the air and return it to the soil. Because of this, farmers often plant beans and legumes in their crop rotations to replenish the soil. Green fruits and vegetables help maintain vision health and strong bones and teeth. They may also lower the risk of some cancers. Green bean casserole was invented in 1955 by the Campbell Soup Company test kitchen. Store unwashed fresh green beans in a resealable plastic bag for up to 4 days. Wash just before using, removing strings and ends if necessary.